Global Travel Media » Blog Archive » Has owner who died at 95 left her famous hotel to dogs? Has owner who died at 95 left her famous hotel to dogs? 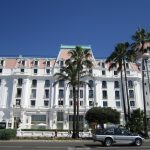 Uncertainty surrounds the future of one of the most famous grand hotels in Europe after the property’s flamboyant owner and chief executive died at the age of 95 without an heir – amid speculation that she may have left her hotel to animals. 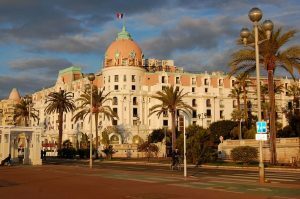 Jeanne Augier ran the striking pink-domed Negresco hotel, in the French Riviera city of Nice, personally for more than 60 years after inheriting it from her father in 1957. She died this week in her 96th year and legal disputes are reportedly already underway about what will happen to the hotel. In 2009, it was reported that Augier planned to leave the hotel and its profits to a new foundation devoted to animals and the poor. Augier championed both causes (she was a great lover of dogs) and she was determined to keep the hotel out of the clutches of international hotel chains. She didn’t even like chains on dogs. Whether dogs will inherit her hotel has not yet been determined. The Negresco opened in 1913 in Nice and quickly became a favourite with European royalty. It has more than 140 rooms, each with its own unique furnishings and French art “collection pieces”. The property has always been open to pets and guests are encouraged to bring them along. Augier famously told Microsoft founder Bill Gates that he was not rich enough to buy her fabulous hotel. 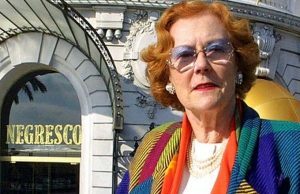 The board of directors and all of the employees of the Negresco Hotel are extremely sad to announce the passing of Jeanne Augier, Chief Executive Officer, on January 7, 2019, in her 96th year. Owner of the Hotel since 1957, Madame Augier worked to revive the hotel and then to extend its influence throughout France and the world. With her husband, Paul Augier, she made the Negresco an incredible Palace, a luxury establishment which reflects her own personality, it is recognized worldwide and is the last great independent hotel in France. Passionate collector, she collected over 6,000 works of art and pieces of furniture covering 5 centuries of French history, paying a majestic tribute to French talent. A relentless advocate of the disabled, people in difficulty and animal rights, she generously worked to ease their suffering. To continue her work, the board of directors and all of the employees intend to perpetuate the creative, free and independent spirit of a great Lady who leaves to the city of Nice an emblem of French “art de vivre”. A mourning period of one month will be respected, symbolised by flying the flags at half-mast at the Negresco Hotel. The board of directors and the provisional administration appointed in 2013 will continue their mission, insuring the management of the Hotel.